Awake, O my harp, your chords, in praise of the Virgin Mary! Lift up your voice and sing the wonderful history of this Virgin, the daughter of David, who gave birth to the Life of the world! Our beloved and holy Mother Saint Mary, the Mother of God (Theotokos), was born to devout parents in the city of Nazareth. St. Joachim and St. Anna entreated God for a child for St. Anna was barren and advanced in years. God, who hears the prayers of the righteous, sent Archangel Gabriel to announce to St. Joachim the joy that St. Anna would conceive and give birth to a child. Greatly rejoicing, they vowed that the child would become a servant in the house of the Lord all the days of her life. Consecrated to God, St. Mary entered the Temple of Jerusalem at the age of three where she served the Lord for nine years receiving food from the hands of angels. When she was twelve years old, Zacharias the priest wanted to find a suitable guardian to care for St. Mary and so he gathered together the canes of twelve men from the house of David of the tribe of Judah and placed them in the Temple. The following day, just as Aaron’s rod once budded, so too did St. Joseph the Carpenter’s cane bud, signaling God’s choice for him as caretaker. After St. Mary and St. Joseph’s betrothal, before they came together, St.Mary was found with child of the Holy Spirit, for Archangel Gabriel announced to her the birth of our Savior – Then the angel said to her, Do not be afraid, Mary, for you have found favor with God. And behold, you will conceive in your womb bring forth a Son, and shall call His name Jesus. He will be great, and will be called the Son of the Highest; and the Lord God will give Him the throne of His father David. And He will reign over the house of Jacob forever, and of His kingdom there will be no end. For two thousand years, the Church has preserved the memory of Virgin Mary as the prototype of all Christians for she was truly pure and unconditionally obedient to God. 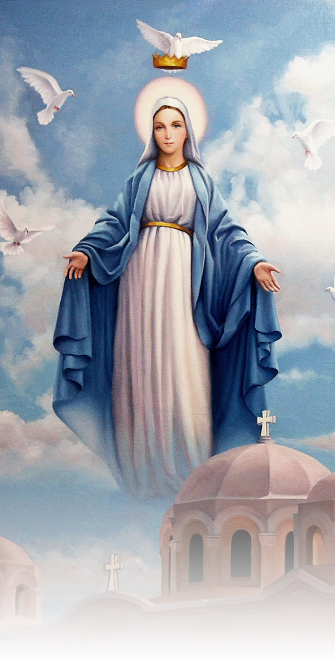 St. Mary is also our model in that she was the first person to receive our Lord Jesus Christ. As she bore our Lord physically, all Christians now have the privilege of bearing God within them spiritually. May her intercession be with us. Glory be to God forever. Amen.